Event Description: These “311” drivers are an EPIDEMIC in this country. Apparently DFW, Tx isn’t the only place in the country that has these psychotically deranged, murderous psychopaths trying to kill, maim, and destroy! There are some reports online about these lunatics running people off the roads and many other violent acts! This particular one is a white Nissan mini van, one of those new “transit” vehicles. I was in the far left lane on Shiloh Rd., going towards Plano Pkwy. This lunatic was speeding and jerking and swerving in and out of lanes, between vehicles, cutting people off and almost rammed into two of them! As we got up to the red light at Plano Pkwy, I was stopping behind this vehicle that was already at a stop at the red light, and this lunatic JERKS across the front end of my vehicle and SLAMS on their brakes!!! If I hadn’t have had my seatbelt on, I would have definitely went through the windshield!!! Then when the light turned green, this murderous lunatic HARD JERKED over from the far LEFT lane in front of me, to the far RIGHT lane across two other lanes of heavy traffic!!! THEN, as soon as this psycho gets all the way over into the far RIGHT lane, this murderous, demented psychopath then TURNS LEFT FROM THE FAR RIGHT LANE ACROSS SIX LANES OF MOVING VEHICLES!!!! Thats THREE lanes of vehicles on EACH side! Then turns up into a parking lot for some business on the corner there! 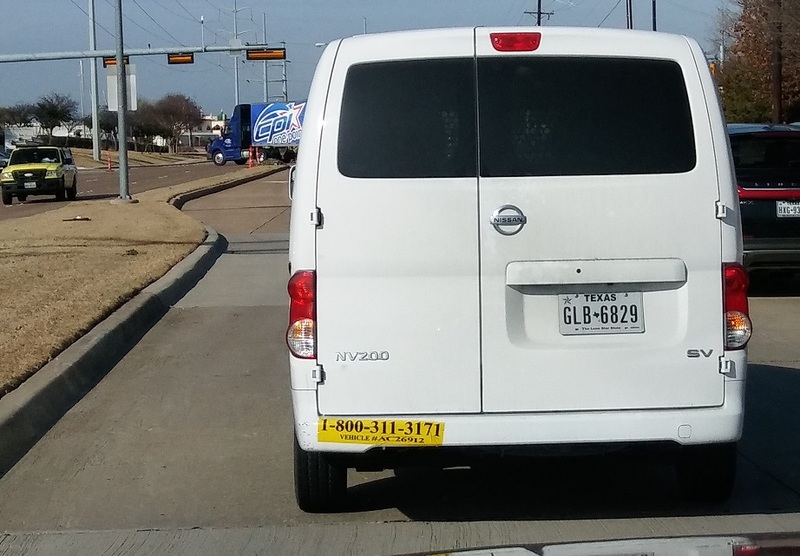 These vehicles have this sticker on the back bumper that has a vehicle number and a 800-311-3171 number on it. These 800 numbers DO NOT WORK! From posts I”ve read online about these lunatics, these phones numbers dont work, or they wont tell you who they are if someone does answer. When I tried to call it, someone just picked up the phone and slammed it back down again! Someone online also posted that they followed one of these lunatics to see where they came from and saw them turn into a parking lot at an Auto Zone store, which had several of these white vehicles with these stickers on them parked there. Around here in Plano, Tx, there is this lunatic and one in a small white compact chevy car that frequents Parker Road. Be warned! These are MURDEROUS PSYCHOPATHIC LUNATICS! And if one happens to cause you grief or damage, or even kills somebody, then you know Auto Zone is probably the culprit. Driver Description: Never saw who was driving.